An expensive bulldog pup has been taken from a North County kennel, and deputies asked the public Friday for help in identifying the dognapper. Photo of missing bulldog puppy and suspected thief released by San Diego County Crime Stoppers. 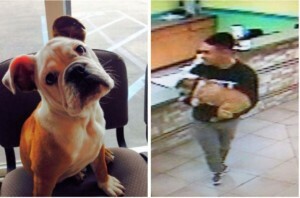 A good Samaritan found the 5-month-old English bulldog, named Schroeder, lost and wandering Wednesday evening and brought him to the kennel in the 900 block of West San Marcos Boulevard, according to sheriff’s officials. About 45 minutes later, a man showed up there, identified himself as the owner of the puppy and left with him. Schroeder’s owners later told investigators they’d paid $4,000 for the dog. It was unclear how he got loose. Deputies released a photo of the dog and dognapper, and asked anyone with information to call San Diego County Crime Stoppers at (888) 580-8477 or contact the agency online at sdcrimestoppers.com. Tipsters may remain anonymous and could be eligible for a reward of up to $1,000.